Wellington Film Society - SEMBENE ! This incisive documentary chronicles the life of the internationally acclaimed filmmaker, considered by many to be the father of African cinema. Ousmane Semb�ne was a self-taught novelist and filmmaker. His ambition was to make films that would reach a vast African audience, from the illiterate to the educated. He dropped out from school when he was in the fifth grade and left Senegal, embarking on a journey that took him to Marseille where he worked as a docker. It was following an accident and the subsequent months lain in bed that Semb�ne began writing. From there he attended the Gorky Film Institute in Moscow and shortly after directed his first short film. Samba Gadjigo and Jason Silverman�s film details Semeb�ne�s transformation into a world class filmmaker, through personal recollection, archive footage and the magnificent films he made. It is a fitting tribute to one of cinema�s great pioneers and storytellers. - Keith Shiri, London Film Festival 2015. What factors drive one individual to be, as Samba Gadjigo puts it here, "stronger than his destiny" � equipped to resist all that life appears to have planned for him, and blaze an unmapped trail instead? In the case of Gadjigo's friend, inspiration and occasional tormentor Ousmane Sembene, the answer seems to be a mix of personal qualities, happenstance occurrences and historical shifts, which are chronicled in this thoughtful and absorbing account of his life, co-directed by Gadjigo and Jason Silverman. Growing up in a village in Senegal, Sembene started life steeped in the values of a fisherman father who told him: "I've never worked for a white man and I never will." But Sembene's own restlessness and curiosity led him away from rural life: he moved first to Dakar, then stowed away on a ship to Marseille, where he worked on the docks. There he was drawn both to leftist politics, becoming a member of the European communist party; and culture, immersing himself in European art. A back injury that saw him laid up for six months provided ample opportunity to read � and to observe the absence of authentic African experience in the literary and artistic canon. "It's not us who create our own image," Sembene said. "It's others who present the image of black people � of Africans." The awakening of Sembene's intellect, creativity and political ideals coincided with a dawning of interest in class and racial politics in Europe and the US, and with the upheavals in his native Africa that saw Senegal and 16 other nations claim their independence in the single year of 1960. Amid this tumult, Sembene published a number of novels, but soon came to see filmmaking as a more direct route to the consciousness of ordinary people. He studied filmmaking for a year in the Soviet Union before returning to the newly independent Senegal to become the first ever sub-Saharan African to make films in Africa, for African audiences and with an African cast and crew. His first feature-length work, Black Girl (La Noire de..., 1966), made him a figure of international interest and led to his being invited to be the first African member of the Cannes film festival jury. For Gadjigo, a gently engaging presence here as narrator, talking head and key character, Sembene's novels and films were a revelation. Having grownup wishing only to emulate the intellectual culture of France, the young Gadjigo was suddenly introduced to a figure who made him, as he puts it, "proud to be an African". That Sembene had risen from such humble origins cemented the case for hero-worship. "You say he was a dockworker? He's self-taught? This guy is GOD. That's how I saw Sembene." Gadjigo's deity would turn out to be an unquiet and demanding one. The academic's repeated attempts to make contact, and to use his position to help promote Sembene's work abroad, met with a degree of stonewalling that is presented rather comically here but makes explicit a significant aspect of Sembene's character: a curmudgeonliness that rendered him notoriously hard to work with or to know. The two men eventually became friends and collaborators, with Gadjigo's work as event organiser, publicist and translator helping to establish the international esteem in which Sembene is now held. 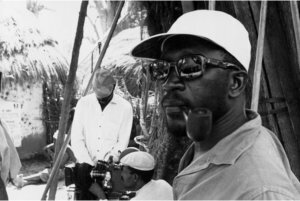 But Gadjigo's experience of rejection and hard-won comradeship inflects the tone of the film, which makes no bones about the trickier aspects of Sembene's personality and legacy � particularly the chapter in which he appropriated money from a fund for new Senegalese filmmakers to make his own picture instead. "I've said that I'll sleep with the devil or the she-devil to get my films made," he said at the time. "But you should judge the films � not Ousmane Sembene." Neither is a straightforward undertaking. To the uninitiated, the tag 'father of African cinema' � which Sembene resisted � and the attentions of clusters of activists and celebrities over the course of his career might seem to position him as a box-ticking emblem of diverse world cinema' � a namecheck for the politically correct. Yet exposure to the films reveals a more multiply challenging figure � one whose work resisted a binary opposition between black virtue and white culpability, insisting that African success if measured by the standards of colonisers was no success at all. His films engage not so much with racism as with the complex structures, both psychological and bureaucratic, left behind by colonisation. He ridiculed black Africans who collaborated with or adopted the values of colonial regimes; rejected any sentimental protection of tribal traditions, right up to his final film, the tour de force against genital mutilation Moolaade(2004); and was a stem critic of Islam, which was the target of Ceddo (1977) and which he called "an invading force, a religion that was more often than not imposed on us at gunpoint". This film succeeds in capturing the man's uncompromising dedication, his charisma and his perplexing personality. Other aspects come across less clearly. His literary career is given scant attention. The content and evolution of his politics � themes of specific films apart � are are somewhat sketchily filled in; and the influences on his filmmaking � the impact, for instance, of Italian neorealism and the French New Wave � go unattended. Perhaps most striking is the patchy coverage of his intimate life. Though we are introduced to a son, Alain Sembene, whom we learn is of mixed racial origins, no information is forthcoming about his other parent. Two other sons, Moussa and Makar, are thanked in the credits but otherwise not mentioned, and the second of Sembene's two wives, American Carrie Moore, crops up briefly in archive footage only to fade from view once more. Perhaps this is Gadjigo honouring his master's own reticence on personal matters. Perhaps it's just that there's too much to say about this most multifaceted of men to fit into one documentary. In any case, as a primer, a spur to further study and a testament to Samba Gadjigo's tireless torch-bearing, this has more than enough to recommend it. - Hannah McGill, Sight & Sound, November 2016.